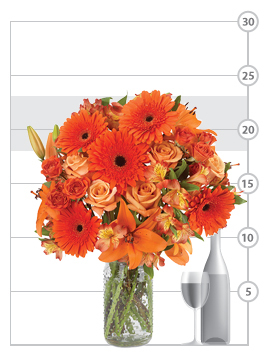 Fusion is defined as “the perception of rapid, intermittent flashes of light as a continuous beam.” Now we’re not saying this bouquet is electric, but it most definitely beams light and warmth! 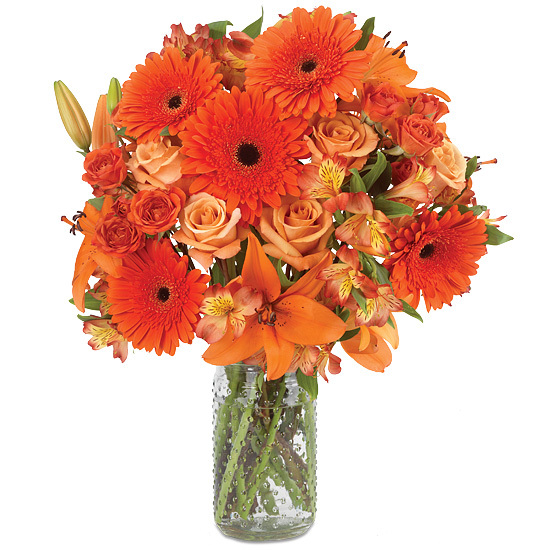 We’ve gathered some of the most vibrant orange blooms we could find, including alstroemeria, roses, Asiatic lilies, spray roses, and Gerbera daisies, each variety sharing a similar hue but bringing its own style and texture to the mix. Our hobnail clear glass vase seemed the perfect container for the lively stems, bringing the bouquet together with its unique country charm.